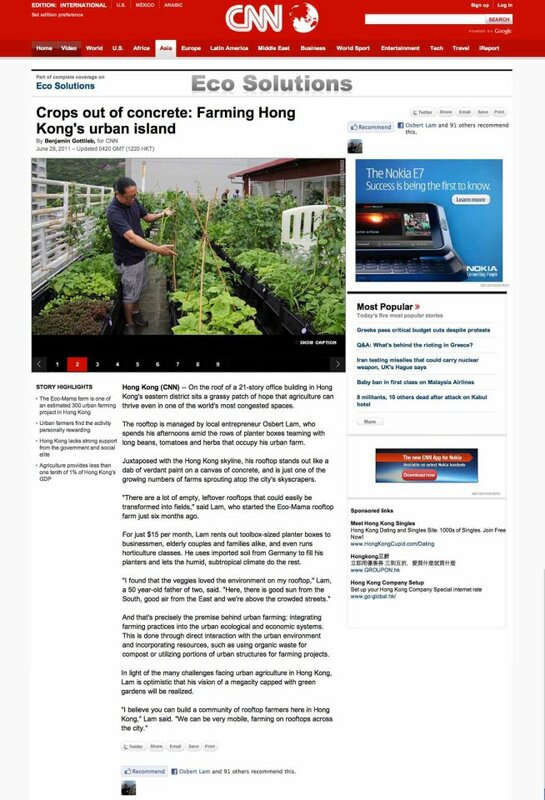 Hong Kong (CNN) -- On the roof of a 21-story office building in Hong Kong's eastern district sits a grassy patch of hope that agriculture can thrive even in one of the world's most congested spaces. The rooftop is managed by local entrepreneur Osbert Lam, who spends his afternoons amid the rows of planter boxes teaming with long beans, tomatoes and herbs that occupy his urban farm. Juxtaposed with the Hong Kong skyline, his rooftop stands out like a dab of verdant paint on a canvas of concrete, and is just one of the growing numbers of farms sprouting atop the city's skyscrapers. "There are a lot of empty, leftover rooftops that could easily be transformed into fields," said Lam, who started the Eco-Mama rooftop farm just six months ago. For just $15 per month, Lam rents out toolbox-sized planter boxes to businessmen, elderly couples and families alike, and even runs horticulture classes. He uses imported soil from Germany to fill his planters and lets the humid, subtropical climate do the rest. "I found that the veggies loved the environment on my rooftop," Lam, a 50 year-old father of two, said. "Here, there is good sun from the South, good air from the East and we're above the crowded streets." And that's precisely the premise behind urban farming: integrating farming practices into the urban ecological and economic systems. This is done through direct interaction with the urban environment and incorporating resources, such as using organic waste for compost or utilizing portions of urban structures for farming projects. Lam's farm -- a humble 2,000 square feet -- is one of an estimated 300 urban farming projects that now occupy Hong Kong's high-rises, joining the broader, global movement of food sustainability projects in densely populated urban settings. In light of the many challenges facing urban agriculture in Hong Kong, Lam is optimistic that his vision of a megacity capped with green gardens will be realized. "I believe you can build a community of rooftop farmers here in Hong Kong," Lam said. "We can be very mobile, farming on rooftops across the city."